I made my first trip of the spring to the farmers market this weekend and I went a little hog wild. I picked up 16 pints of strawberries, pea shoots, carrots, snap peas and the most amazing bunch of baby beets. The beets themselves were so small, they almost didn’t seem worth the effort but those greens on top, simply lovely. If you’ve been tossing your beet tops, you need to stop that immediately. Go fish them out of the compost pile if you can because you are throwing away what in my opinion is the best part of the beet. There has been a lot of talk on the internet lately about zero waste cooking and I am a huge advocate of that whenever possible. A plants growing cycle is an amazing thing. 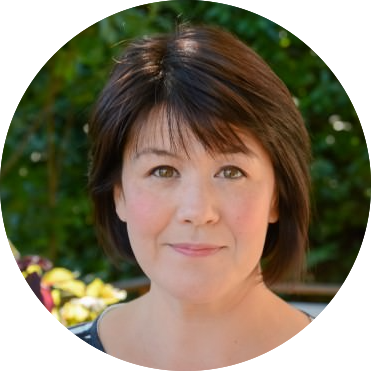 To watch something go from a tiny, barely visible seed into a huge productive plant in a single season is really one of natures greatest feats. Over the years I have posted recipes utilizing ingredients that most people toss in the garbage, like this carrot top pesto and this fava greens pasta. I love to explore new ways to utilize every part of an ingredient before giving up on it. 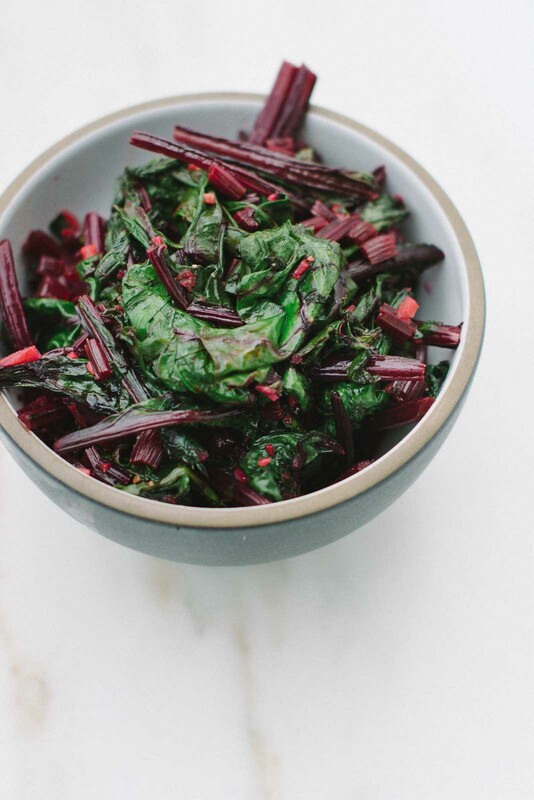 Beet greens are a great substitute in recipes calling for sautéed greens, like chard, spinach or kale. 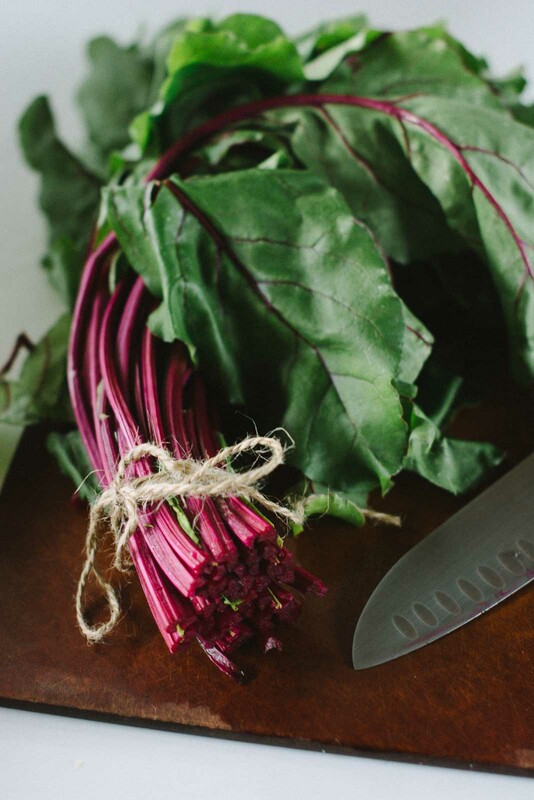 They are slightly sweeter thanks to the sugar content in the beets and impart a lovely color and texture. I like to thinly chop the stalks and cook them down a bit and then add the greens the last few minutes of cooking. This bowl is super easy to make. 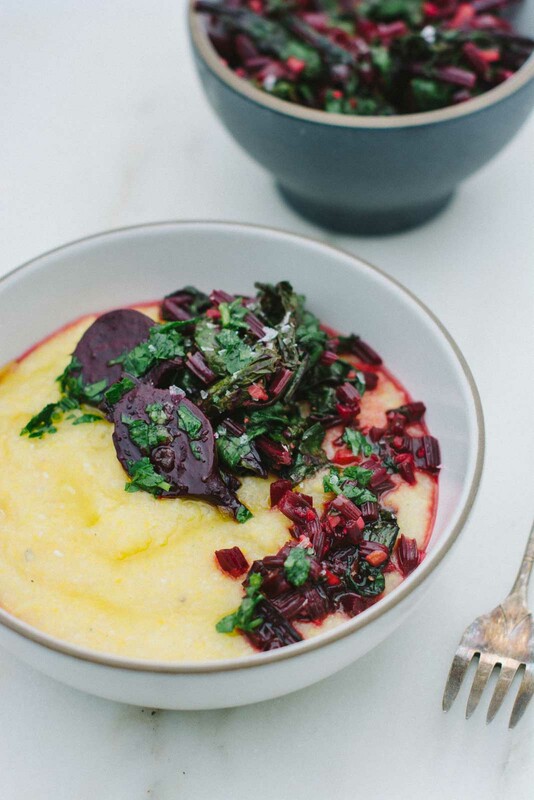 If you haven’t made polenta before don’t be worried about it. 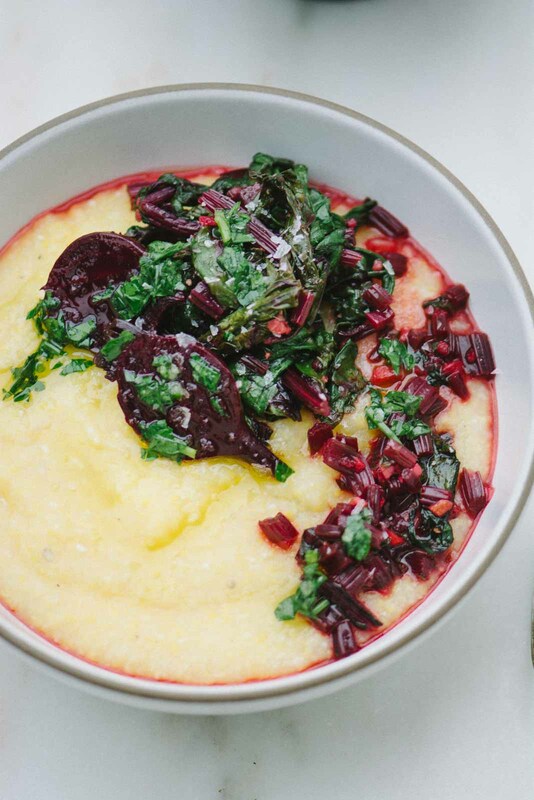 Polenta is basically corn porridge. The biggest trick to cooking with it, is to make sure you use enough liquid, moderate your temperature and stir occasionally. 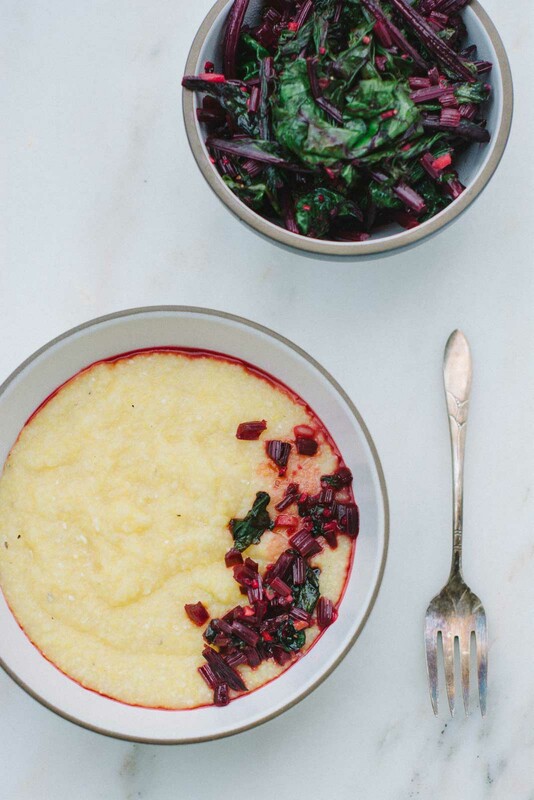 To keep it simple, I soak my polenta overnight which greatly reduces the cook time, but you could also use quick-cooking polenta if you are short on time. This is a really loose recipe. The dish is great with or without the beets but it definitely is hardier with the beets. To keep the dish vegan omit the goat cheese but make sure to include the parsley sauce if you skip adding the cheese. This is a great dish to prep or plan on a Sunday. 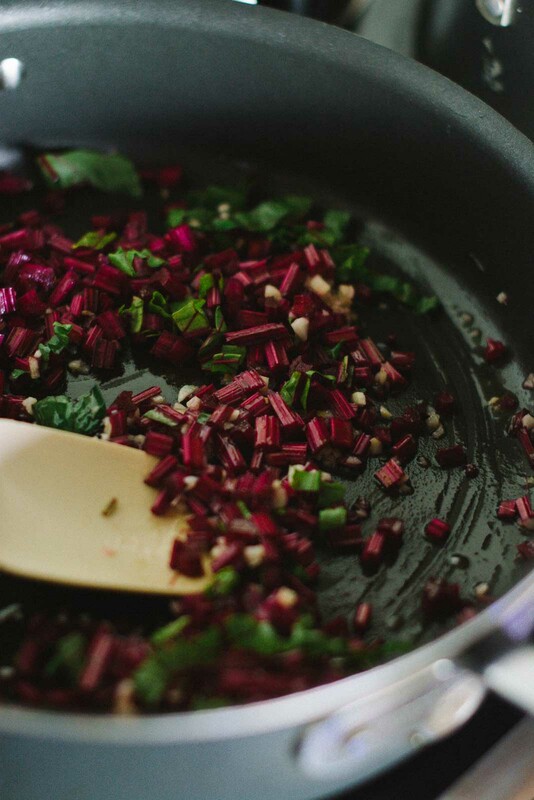 You can roast up a batch of beets and they will keep in the fridge for about a week. I prefer to soak the polenta overnight but it’s not vital. Just be prepared to add an extra 20 minutes or so to the cooking time. I don’t usually use quick-cooking polenta but it can be prepped in 10 minutes or so if you are short on time. 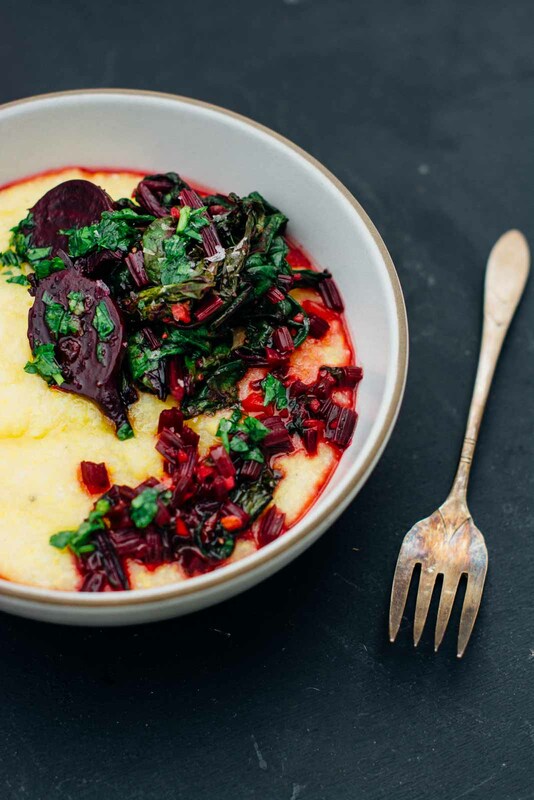 I’d love to hear what you think of my sautéed beet green and polenta bowl. If you give this recipe a try, post a comment, or take a pic and tag it #scalingback on Instagram! With a little planning this bowl makes a great weeknight dinner. Roast the beets the night before, and soak the polenta. Dinner can be ready in about 20 minutes the next night. Place the 4 cups of water in a large saucepan, add the polenta and stir to combine. Let sit at least 4 hours or up to overnight. Pre-heat the oven to 400 degrees. Remove the greens close to the stem end and set aside. Lightly scrub the beets under cold water to remove any excess dirt. Place the beets on a large piece of aluminum foil and coat with 1 tablespoon of olive oil. Season with ½ teaspoon of salt, wrap the foil around the beets and then place them on a large baking sheet. 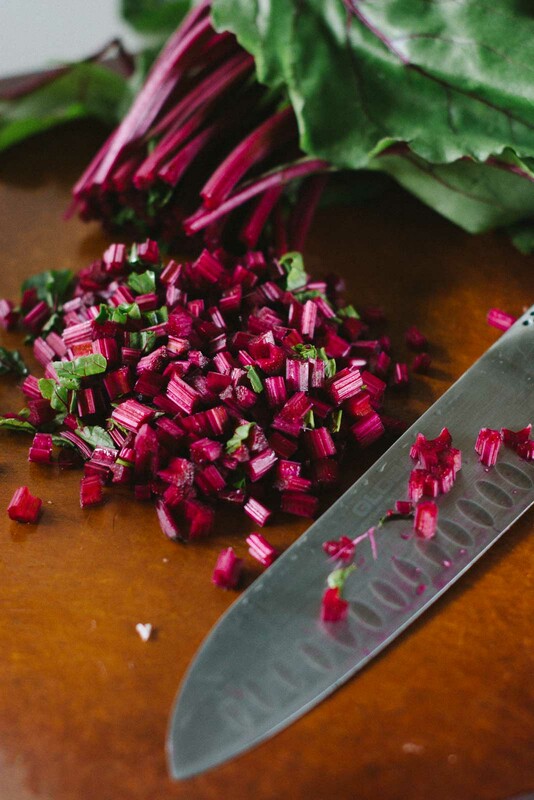 Roast the beets for 30-45 minutes or until you can easily pierce them with a fork. Let the beets cool slightly, then rub the skins with a damp paper towel, the skins should peel off easily. Cut the beets into quarters or slice them if they are large. While the beets are roasting prepare the polenta. Bring the soaked polenta to a boil over medium heat, stirring constantly. Once it reaches a boil, reduce the heat and cook, stirring occasionally until the polenta has thickened about 15-20 minutes. If you choose not to pre-soak the polenta expect the porridge to take 30-45 minutes. Add the salt and goat cheese if using. Taste and adjust the seasoning if desired. Cut the stalks off the greens and thinly slice them. Coarsely chop the leaves and set them aside. In a large skillet, heat the remaining tablespoon of olive oil and chopped garlic over low heat until the garlic starts to sizzle lightly but don't allow it to brown. Add the stalks to the pan, increase the heat slightly and stir until the stalks start to soften 3-4 minutes. Add the greens and cook for another 1-2 minutes until they wilt. Stir in the salt and sherry vinegar, taste and adjust seasonings as desired. For the parsley sauce, combine all the ingredients in a small bowl and season to taste with salt and pepper. 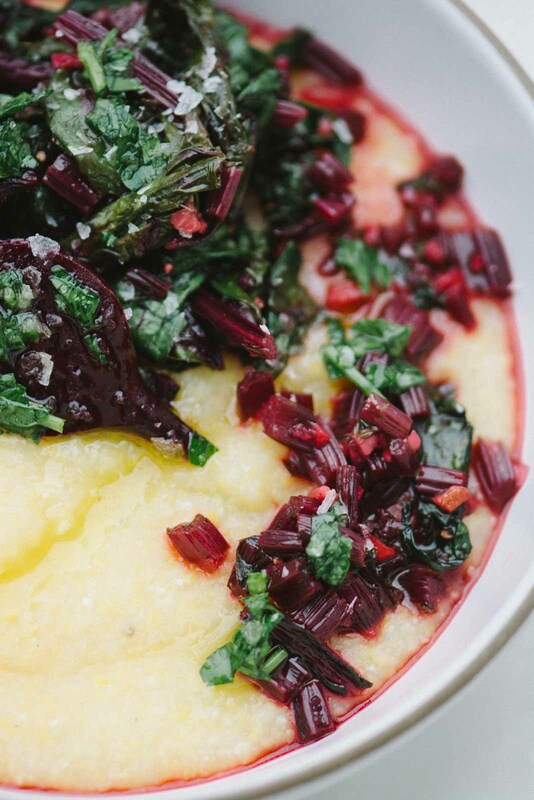 To serve, spoon the polenta into a bowl, top with the beets, greens and a drizzle of the parsley sauce. Note: The polenta will thicken as it cools. If you need to loosen it up, just add a bit of water and stir well until you get the desired consistency.